A Guide to Social Media for Nonprofits. Nonprofit organizations have become increasingly social over the past ten years. They have cultivated a dedicated Facebook follow and on Snapchat. Social media is a great way to tell a story, engage supporters, and get results. What a better time than the NOW to revise a nonprofits social media strategy. But let’s think, how can you prove the value of social media for the organization? This can be a tough question but this guide will help your organization succeed within the present times of social media. Determine what the organization wants to accomplish. Do you want to eliminate poverty? Do you want to protect endangered species? Identify the target audience – The general public is not an audience, that answer is too broad! If your organization says the general public, most likely you are not speaking to anyone. You should develop audience personas. These personas are representations of ideal supports based on demographic data and information data within the members of a target audience. Twitter and Facebook are great social media management tools that provide native analytics. Sprout Social is another great way to connect profits to populate demographic data. Once the target audience has been found, research should be done to gain additional insights to support the cause of the organization. Choose the right networks – Social media demographics is a huge part of where you can find active users on certain networks. The biggest downfall in social media is adopting to every network to spread information. The information will be too thin and not substantial to your audience. Suggesting two or three networks that reach your audience will provide better content and grab the attention of your audience on a more personal level. Create a strategy for content. Examine past posts from competitors. What worked, what didn’t? Develop categories for social media that can be cycled through on a regular basis. Find what problems people have in their own lives and work off that information. TRACK and MEASURE results – Track your progress. Show results that work towards your goal. Beth Kantersaid “If it doesn’t get results, don’t do it. You don’t get impact by wishful thinking.” You should be looking at what content gets a good rate of return and what takes less time to get that return. A great tool to help with tracking and measuring results in Google Analytics. 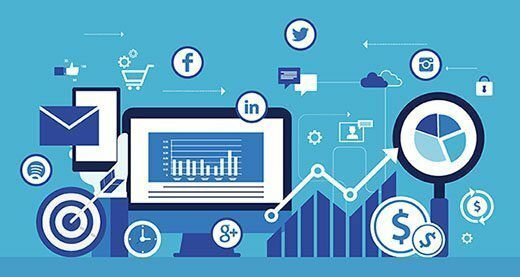 Analytics is a great way to showcase numbers and help paint a picture towards the goals of your social media strategy.